Happy New Year, dolls! I can't believe how quickly 2012 went by; what a year it was! Here is to a fabulous and joyous 2013! Thanks so much for all of your constant support throughout the years. You all are the best! When it comes to makeup application, I am sure that many of us constantly aim for that natural looking, flawless finish. Like a 'my skin but better' sorta thing. One of the most popular finishing touches to achieving just that is with a light dusting of a high definition powder. High definition powders are usually sheer, finely milled, and contain a smooth texture that softens imperfections, thus giving the skin a soft-focus appearance. A few months ago, I decided to order E.L.F. 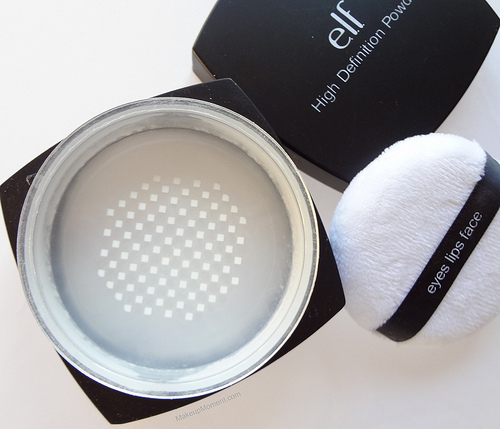 's Translucent High Definition Powder ($6.00) from their studio line to try out. It looked promising, and the affordable price tag made this product even harder to turn away from. Well, I must say, I was pleasantly surprised by this powder. E.L.F. 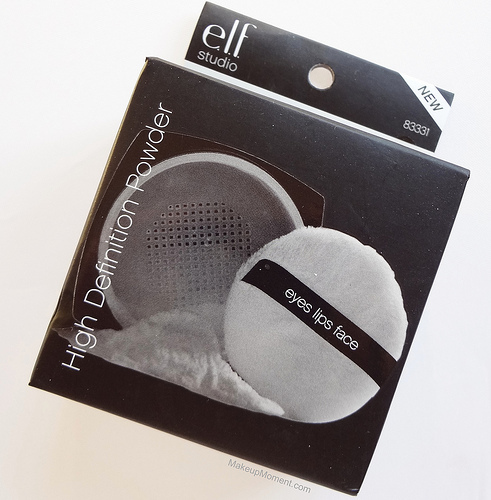 's High Definition Powder comes housed in a rather bulky and large sifter jar, with a screw on/off lid. Although I prefer to apply this powder with a large fluffy brush instead of the included puff, I gotta admit, the puff is pretty handy to have when touching up on the go-among other things in which I will get to in a minute. Loose powders like this one in sifter jars often get a bad rep for their messy nature. But I have a few helpful tips that work like a charm to eliminate the fuss of an otherwise messy situation. The sifter holes contain a transparent sealing sticker atop, which I suggest not removing. Instead, poke 2-3 holes through the sticker to create just a few openings that will dispense the product. Also, if you aren't going to use the included puff and are tempted to toss it out, consider keeping it in the jar. It does a great job at sealing and keeping the powder in, without having it spread everywhere in the jar. Trust me, these tips lessen the mess and make a world of a difference. As expected, this powder contains a finely milled, and pleasant smooth texture that makes application effortless. 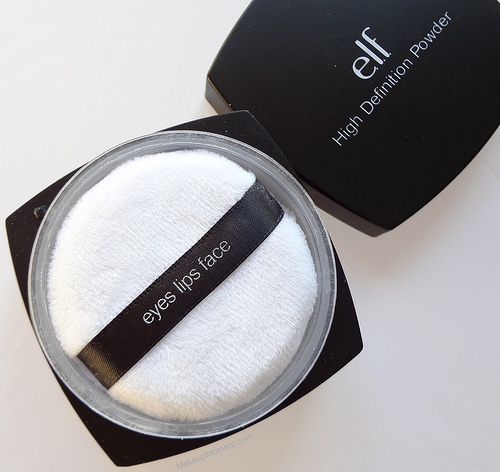 The powder feels lightweight and it goes on completely sheer and is undetectable on. It's amazing how the finish is so natural looking-no caked on or powdery look, here. It most certainly softened and minimized the look of the pores on my cheeks. and gave my skin texture an overall softened appearance. I have a pretty oily t-zone area and after a few hours in, I find that I need just a very minor touch up on the areas that are prone to oiling. But honestly, I can get away without touching up if need be. When I have this high definition powder on, I notice that my face doesn't produce as much oil as it usually does, which is nice. But if I want that true perfecting finish by mid-day, I can touch-up and layer on some more of this powder with ease without worrying about product build-up. I think this powder is one that is appropriate for all skin types to use. As someone with oily, dry, and acne prone skin, I am happy to report that this powder doesn't enhance dryness, it has not irritated my skin in any way, and it hasn't caused breakouts either. Score! Overall: E.L.F. 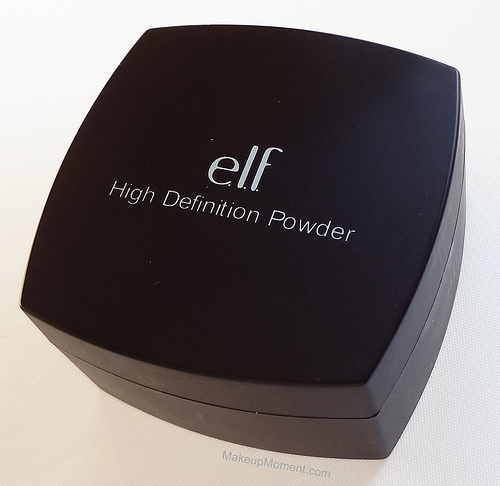 's High Definition Powder is a nice affordable option for those of you who are on the market for an HD setting powder, that will give off a soft focus finishing touch to your face. For $6.00, you get a lot of product that will surely last a good while, as a little always goes a long way. This is a product that has become a staple item for me, whenever I am looking for a near-perfect, finishing touch to my skin. What do you all think of E.L.F. 's High Definition Powder? It sounds so good! I think I'm going to order soon,since I want something more fine for under eyes area! Thanks for the review! The banana powder has been on my wishlist for so long! It gets so much hype in the beauty community. I have to try it soon!!! !